In part 1 we broke down last week by each day to identify the top market movers for Asian, European, and US risk asset markets, and to help sort out implied conclusions and lessons for the coming week. Here are the big conclusions and lessons for this week and beyond. China’s January trade figures exceeded forecasts, suggesting continued improvement in the second largest economy and the world’s top growth engine. Imports surged 28.8%, versus an expected 23.5 %. Exports were up 25% versus and expected 17.5%. In sum, both China and its customers are spending more and showing greater health than expected. The only qualification to the data was that it was probably somewhat distorted to the upside due there being an extra 5 working days in January 2013 than there were in January 2012. The U.S. trade deficit plunged 20.7% to $38.5 bln versus an expected $46.0 billion. The shrinkage was due in large part to a drop in energy imports and a large rise in energy exports. Per, Bloomberg, this was the lowest petroleum deficit since August 2009. Year over year, barrels of crude oil imported fell to its lowest level since 1997. Japan’s deteriorating trade data is yet another sign of what appears to be an eventual (timing unknown) but thus far unavoidable crash of the world’s third largest economy. Japan is an export economy, and so if healthy should post solid current account data. There are two reasons Japan’s government has among the lowest borrowing costs in the world. Japan’ traditionally strong current account and trade balance is one of the reasons its sovereign bonds are bought despite their extremely low yields, despite its having the highest debt/GDP ratio in the developed world. Japan is like a high income individual with high debt, it’s considered credit worthy based on its income. The other reason Japan bonds sold at high prices and low yields was strong domestic demand, but that’s fading too because its rapidly aging population (25% over age 65) is buying fewer bonds as more hit retirement age. As these twin pillars supporting low Japanese borrowing costs crumble, Japan seems an economic disaster waiting to happen. Japan cannot stay solvent for long if it’s benchmark 10 bond rate rises from its current ~1% to even just 2% (similar to that of the US). Even at current low rates, its debt service expense consumes well over 25% of its national budget. I’m only talking about its federal debt. Leave regional and municipal debt for another time. Just a 1% increase in its benchmark yields could double its debt service costs, which would become the majority of its budget. This will not end well. The only question is when. I’m hardly the first to point this out, but shorting Japan thus far based on its shaky fundamentals has been a loser’s game. Those who have tried shorting Japanese government bonds in the past have lost badly, and the trade is thus known as “the widow maker’s” trade. Sure, Japan can always repay the bonds, because they can print all the yen the want. The question is what those yen will be worth. As long as bond buyers believe they’ll be repaid in yen of equal or higher value, they may well continue to buy Japan bonds at these low rates. So the real question on which Japan’s fate depends, is how it plans on maintaining confidence in the value of the JPY, when they are aggressively trying to drive it lower? Ultimately they can’t have it both ways forever. They can have a much weaker Yen and boost exports, and their stocks. They can maintain confidence in the Yen and keep bond rates low, as long as their trade data remains sound. Here’s the bigger near term threat. The current rally in risk assets is, more than anything else, based on improved confidence concerning the biggest market moving issue since 2010, the EU sovereign debt and banking crisis. That’s all it’s based on, confidence that all will be ok. Outside of Germany and a few other small funding nations, actual economic data and earnings in the EU have deteriorated. The rally in EU stocks and the Euro began their latest rally in the summer of 2012 with the ECB’s announced new OMT program to buy supposedly unlimited amounts of bonds from any EU nation agreeing to submit to the ECB’s conditions for giving the aid. These conditions are politically unpalatable, thus no nation wants this aid and the ECB has not had to spend a Euro thus far. It’s been nothing but verbal support. Yet, that was enough to restore confidence in Spanish and other GIIPS block bonds. Their yields fell, confidence increased, and the EUR began its rally based on this presumed reduced solvency threat. Of course except for lower borrowing costs, based purely on confidence that the OMT program will work, the situation of the GIIPS nations has not improved, and indeed has deteriorated. For reasons discussed above on Monday’s highlights, the rising risk of Berlusconi’s return to power means that Italian policies could again send Italian borrowing costs soaring to compensate for perceived credit risk. Of course, a lot can happen before and after the Italian elections, so Berlusconi’s return to power is far from certain. However the corruption scandal in Spain threatens the ruling coalition in Spain. For all its considerable faults, it remains the one most likely to continue to cooperate with the EU and avoid a bout of EU solvency crisis, or worse. Then this past week, after denying all corruption allegations, he admits to at least some. He’s accused of receiving over 300k euros in illegal payments over the prior decade. In sum, we have the current confidence in the EU’s recovery resting on the ongoing solvency and recovery of Spain, a broken economy that can’t repay its debts, run by leaders who consistently don’t tell the truth about their economy until they need another bailout. Markets believe that bailout will come when Spain accepts OMT conditions. However we’ve no clear evidence that Spain will agree to the OMT’s conditions. Why should it. So far the EU continues to bail out Greece due to fear of contagion, so why would it deny Spain, which is a much bigger contagion threat. It’s so easy to just print more Euros. Heck, when faced with contagion threat, it looks almost like sound, responsible policy. Given the negative events in the EU this week, the EUR had its first real down week since the start of the year. However most analysts agreed that with indexes at decade highs, risk assets such as stocks and the EUR were due for a normal (5%-15%) correction anyway, and that the pullback should be viewed as both temporary and as a buying opportunity. As we wrote in our conclusion to our summary of all 2013 forecasts here, and in our subsequent weekly reviews and previews, we’re very skeptical about the prospects for stocks, risk currencies, and other risk assets to head much higher. Why? Here’s the short version. Look what happened the last two times stocks were at these levels. 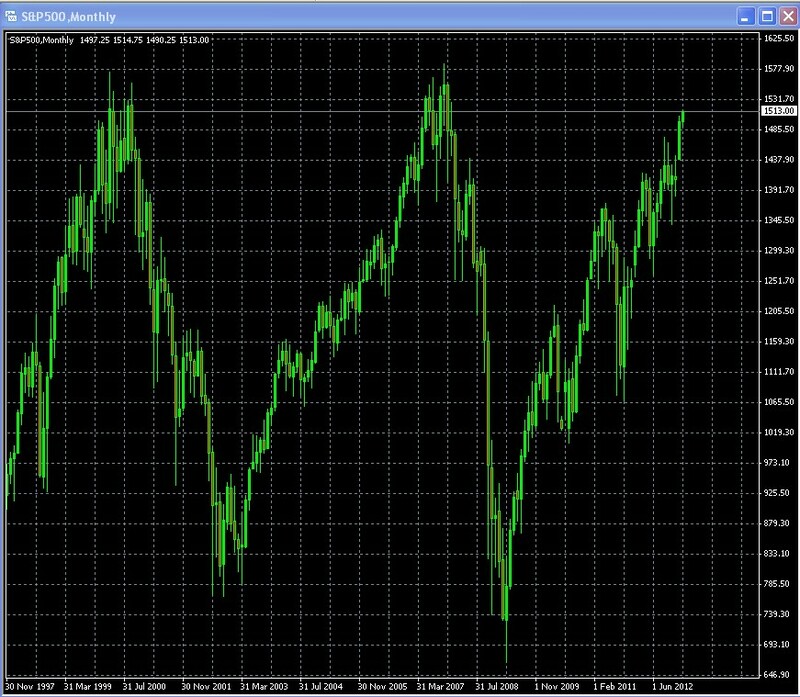 We use the long term monthly S&P 500 chart below as an example of what happened worldwide. I’m far from the only one to notice this. So if you doubt me, see here, for more from Nomura bank’s Bob Janjuah. 2. Is This Time Really Different? Yes, but not in a good way. When risk asset markets peaked in 2000 and 2007, the fundamental picture was widely perceived to be very good. Growth everywhere, no EU or US sub-prime crisis, contagion was just a medical term, etc. The current rally is not the product of actual wealth creation or even the belief that it’s coming. Rather it’s the result of coordinated central bank intervention causing asset price inflation through lots of real (or threatened) printed fiat currency and historically low interest rates forcing those seeking yield into riskier assets. This isn’t the place to go in depth into why this policy can’t last, but it’s widely understood that it can’t. As we discussed in last week’s post here, after saying last summer that it was merely auditing its gold reserves held abroad to make sure all is kosher, suddenly Germany is repatriating its gold from foreign storage facilities. It claims there’s no issue of trust, of course. This move comes as part of a series of steps we mentioned in the same post here that Germany has been taking to prepare for future EU turmoil. We already know that Japan and the EU ex-Germany are struggling. Given the above technical and fundamental picture, we remain unfashionably bearish, without even touching on geopolitical risks in Southeast Asia (Japan/China) and the Mideast (Israel/Iran/Syria/Egypt, etc). Because few others seem to care about the topic, despite the risk to anyone with significant exposure to the USD, EUR, JPY, GBP, etc, we continue to sound the alarm about the stealth tax that major central banks of the world have in store for you by making your money worth less than it is today. As noted above, future bailouts for Spain, possibly Italy too, are likely to be affordable only with printed funds. Also, ECB head Draghi hinted this past week that further EUR appreciation might require ECB intervention. As noted in part 1, the latest money printing headlines continue to roll in from Japan. The early exit of the current BoJ Governor means the new administration may start printing new piles of JPY sooner than previously expected. That was good news for Japan’s exporters and stocks, because the belief is that a cheaper JPY will boost their returns. However it will also lower the value of assets held in Yen. While that’s definitely bad news for Japanese savers, it could become a real problem for Japan if bond markets decide that the risk of being repaid in diluted yen deserves to be compensated in higher yields. 5:31 AM Shinzo Abe’s desire to appoint a Bank of Japan governor who will boldly go where no BOJ governor has gone before is hitting opposition in his own cabinet and among financial bureaucrats, who fear that radical new policies could spark a dangerous rise in bond yields (Emphasis mine). It could mean that the Japanese PM might have to settle on a compromise candidate, especially as he needs the consent of the parliament’s upper house, where his LDP party lacks a majority. First, if you haven’t done so already, see here (North America)or here (outside of North America) for information about the most up to date guide on a wide range of conservative strategies to diversify into the currencies most likely to hold their value, and the assets linked to them. You can find a topic summary, reviews, and even read huge chunks of the book. There’s nothing better to convince central bankers to respect their currency than having masses of investors dump it in favor of better ones. Until they impose capital controls, we don’t have to take their abuse. Second, for this week only, we have another tool to spread the word about the dangers of the global trashing of fiat currency and how to cope with it without undue risk, training, or aggravation. There’s nothing like a nice award from an important currency site to attract some attention to the cause. 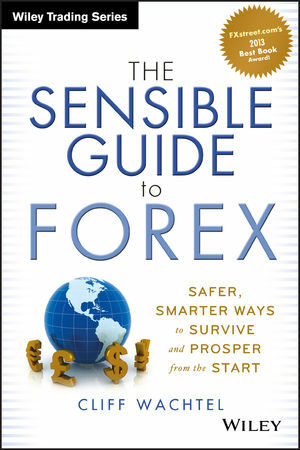 Please take a moment (about 120 seconds, actually) and cast your vote for “The Sensible Guide to Forex” in FXstreet.com’s Awards 2013 in BEST NEW BOOK category. The link to the survey is here.